1. BU's Jack Parker leads all coaches in three major postseason categories: Frozen Four appearances with 13, tournament appearances with 23, and tournament wins with 30. 2. Michigan's Vic Heyliger leads in consecutive Frozen Four appearances with 10 from 1948-57, in total Frozen Four wins with 16, and in NCAA championships with six. 3. Jack Parker ('68) and Rico Blasi ('94) are both alums of their respective programs. 4. BU's win in the championship game was also their 35th for the season, a new record. 5. 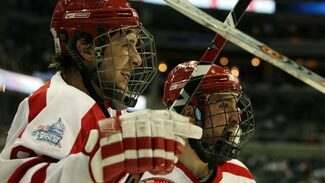 Blasi has led his RedHawks to four consecutive NCAA appearances. Boston celebrated on a sun-splashed afternoon Tuesday, throwing the BU Terriers a parade from Kenmore Square along Commonwealth Avenue to their main campus along the Charles River. The city of Oxford, Ohio, would be well-served to do the same for their Miami RedHawks, who came about as close as a team can to winning its first national title in any sport. "Fifteen teams lose their last game," said BU coach Jack Parker about the postseason. "Everybody goes home dissatisfied except the champion." Miami was on the cusp of a championship, taking a 3-1 lead into the last minute. But BU pulled two rabbits out of its hat within 42 seconds when Zach Cohen scored at 19:01 and Nick Bonino knotted it at 3-3 at 19:43, both goals coming with goaltender Kieran Millan on the bench for an extra attacker. Colby Cohen then completed one of the greatest comebacks in NCAA history with the game-winner at 11:47 of overtime. Needless to say, the postgame press conference was a tale of emotional opposites. Here are some excerpts and paraphrases of each coach's comments with the media throng at the Verizon Center in Washington last Saturday night. On the last minute of the game: "I can tell you we had the right guys on the ice. We knew exactly what they were going to do. We were trying to keep our guys focused. Unfortunately, they got caught up in the moment and BU made a play that we talked about on the bench, actually. So, it's one of those things. I'm so proud of how our guys played, right into overtime." On what this game means to the Miami program and to Blasi personally: "As I told the team, they have a lot of people supporting them, not only in Oxford, but alumni across the country. And I'm pretty sure we've got some more fans in college hockey now. What the boys did this week, the last couple of weeks, is they made history. No other team has ever gone to a semifinal; no other team has played for a national championship. It doesn't feel good right now, but the sun will come up tomorrow and the guys will realize what they accomplished." On comparing being so close to getting to the Frozen Four last year and this year's experience: "I would say, that it's worse (this year) obviously. We didn't get the bounce at the end. But in my book -- and I know in a lot of hearts around campus and alums and supporters, they're national champions in our book. So, it's going to sting for a while, but we made history and hopefully we can continue that into the future." 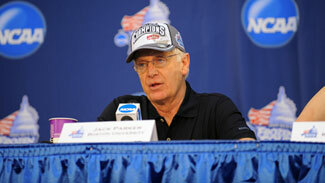 Boston University's Jack Parker won the 2009 Spencer Penrose Award earlier this week, given annually by the American Hockey Coaches of America to the Division I coach of the year. Parker also received the award in 1975 and 1978. Parker led his Terriers to the national championship against Miami last weekend in Washington. Parker completed his 36th season behind the BU bench, and won his 800th game during the season, both milestones by any coach in NCAA history. BU's 35 wins this season were also a record. On what made captain and Hobey Baker winner one of the best captains Parker ever had: "The way he handled his teammates; he was an example as well as a leader. He made me accountable. Literally, he made me a better coach. He was like an assistant coach -- the straw that stirs the drink as far as leadership is concerned." On how great this BU team and the variety of players were in big games: "I've never seen nothing like this; we were getting a big goal here and a big goal there -- always seems like they're always late. We've had that all year." On who Colby Cohen is and scoring the game-winning goal: "The reason we recruited him is he's great on the power play, not only because he can move the puck, but he's got a cannon. The reason he got the game-winning goal is he's a terrific offensive defenseman who can shoot the puck 100 mph." On what Parker told the team in the locker room before overtime: "This is an opportunity that you probably didn't think you had with (a few minutes) left in the game. You've got to make sure you play the right way and sooner or later we'll get a goal." On the penalty kill that was a perfect 7-for-7: "I don't think it was anything technical. They played a little bit harder and smarter, and the effort was there for sure. We took stupid penalties and penalty killers bailed those guys out." On comparing this team and the title with previous BU teams: "The big thing was in our last two national championships we beat our archrivals (Maine in '95 and BC in '78). When we won it in '72, we beat Cornell, which is our biggest rival. I was glad to get away from Hockey East teams and play somebody different in the final. (But) Miami is a hell of an opponent and everybody knows who they are now."